FA: possibly Bryan Bird, Joe French, 12/05. The upper part of this route is an obvious straight-in crack system that begins off a ledge a couple hundred feet up the east face. This is a fun route with a great summit. We didn’t find any evidence of a previous ascent, but it’s such a natural line that I’d be surprised if someone hadn’t done it a long time ago. 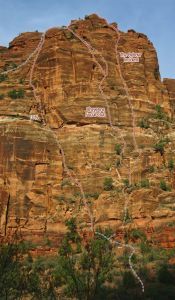 Descent: down climb west toward Angels Landing, down corners and ramps on the south side of the ridge. Locate a juniper tree with slings and do two consecutive single-rope rappels. Continue down vegetated ramps to the skiers right and locate another juniper with long slings and do a 55m rappel to the ground. Which SuperTopo guidebooks include a topo for The Oxbow Incident?